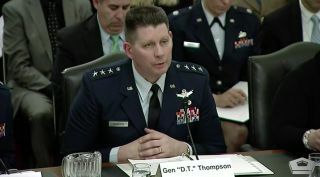 Lt. Gen. David Thompson, vice commander of Air Force Space Command, testified March 27, 2019, in front of the Senate Armed Services Committee's strategic forces subcommittee. WASHINGTON — The U.S. military's early warning and surveillance network on Wednesday at 1:39 a.m. EST detected India's missile launch aimed at one of its own satellites in low Earth orbit. "We were aware," said Lt. Gen. David D. Thompson, vice commander of Air Force Space Command. Once the launch was detected, "we immediately started providing notification to satellite operators," Thompson said on Wednesday during a hearing of the Senate Armed Services Committee's subcommittee on strategic forces. The anti-satellite weapon test carried out by India's Defense Research and Development Organization was code named "Mission Shakti." A missile launched from the ground slammed into a satellite at an altitude of about 300 kilometers. Thompson declined to specify the exact elevation as it might be classified. He noted that the International Space Station was "not at risk." The issue was raised at the hearing by the subcommittee's ranking member Sen. Martin Heinrich (D-N.M.) who asked Thompson about the risk that such tests might pose to U.S. and allied satellites. Thompson said the 11th Space Warning Squadron at Buckley Air Force Base, Colorado, detected the launch. The National Space Defense Center at Schriever Air Force Base, Colorado; and the 18th Space Control Squadron at Vandenberg Air Force Base, California, also supported the effort. "No other nation or other military, or civil agency could have detected, characterized and warned" about a threat in space, he said. In response to Heinrich's question on whether DoD supported a "code of conduct" for space activities, Kenneth Rapuano, assistant secretary of defense for homeland defense and global security, said the Pentagon is "involved in discussions internationally" about the use of anti-satellite weapons but noted that space security is an effort led by the State Department. "We have participated in non biding confidence building measures associated with activities in space," he said. "We are proponents of safe and sustainable space and the minimization of space debris." Speaking with reporters after the hearing, Thompson said these types of tests are "always concerning and pose a risk certainly to our satellites and all satellites." Any time a test like this occurs, "it's a concern," said Thompson. "It's not just a matter of whether it's a risk to our satellites, but when they generate debris that might be there for a long time, it might have cascading effects." The dangers of space debris also came up on Wednesday at a hearing of the House Appropriations Committee's commerce justice and science subcommittee. NASA Administrator James Bridenstine said there is a need for better space situational awareness and debris tracking. He warned the problem could get worse if more countries start testing anti-satellite weapons. "Debris ends up being there for a long time," Bridenstine said. "If we wreck space, we're not getting it back." Destroying a satellite intentionally and creating debris is "wrong," he insisted. "Some people like to test anti-satellite capabilities intentionally and create orbital debris fields that we today are still dealing with. And those same countries come to us for space situational awareness because of the debris field they themselves created." The space situational awareness provided by the U.S. military is paid by the American taxpayer and offered to the world for free, he said. "So the entire world needs to step up and say, 'If you're going to do this, you're going to pay a consequence.'" SpaceNews senior writer Jeff Foust contributed to this report. This story was provided by SpaceNews, dedicated to covering all aspects of the space industry.